This coming week is Weight Stigma Awareness Week, created by BEDA, the Binge Eating Disorder Association (of which I currently serve as President). Do you have a story to share about weight stigma or size-ism; derogatory comments made about your weight, bullying, or weight discrimination…or a triumph over size-ism? Please share your stories with us and read those others have lived and overcome. Stories can be submitted at www.weightstigmaawareness.com and Tweet using #noweightstigma. Together, we can change the world! I just wanted to feel safe…and loved. I longed to find some place safe from bullying. I wanted to stop expecting the next comment to be about what foods I should or should not be eating. I didn’t want to be accused daily, “Did you eat ice cream at recess today?” I wanted to climb under the exam table when our pediatrician, at my mother’s unrelenting insistence, acquiesced and prescribed Dexedrine, speed, for a totally healthy, albeit chubby, 8 year old girl. Home should have been a safe place. I was a little kid, always on guard in my own house with my own family, made to feel uncomfortable in my own skin…just waiting. The message was loud and clear. I was smart, sweet, well behaved. I had a “very pretty face”, blond curls, bright blue eyes. But, “What a shame…”. I was too fat. Loud and clear and heart breaking; I was not acceptable, as I was. This message, this weight stigma, was ever-present. It came from my Mom who had her own body issues, and from an unhappy older brother who clearly saw me as an interloper in his world. He seemed compelled to carry his anger and his bullying into our school. He’d yell, “Hi Tubs”, whenever our classes passed in the hallways, as if to distance himself from this shamefully fat little girl to whom he was unfortunately related. By junior and senior high school he’d gotten all of his friends in school, at home, even at summer camp, to call me “Ray”, after Ray Nitschke, a middle linebacker for the Green Bay Packers. Nowhere was safe. The message was also delivered by my grandmother, my mother’s mother, who regularly baked cupcakes and cookies to express her love for her family, and then sternly stated, in front of everyone, that I was only to eat “one”. My grandfather was equally direct. Over and over again he offered to pay me one dollar for every pound I could lose. 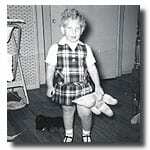 When I look back at pictures from my childhood, I still expect to see a grotesque little girl. There had to be some sane explanation as to why everyone felt I was not OK as I was. But there are no pictures of an unacceptable little girl…just pictures of me. For me, weight stigma started at home. How sad it is that I never felt safe…or acceptable in my own body. 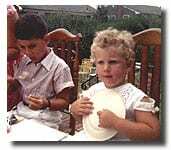 Is there any wonder why I grew up vulnerable to developing a binge eating disorder? Leave a CommentFiled Under: Body Esteem, Changing our World!